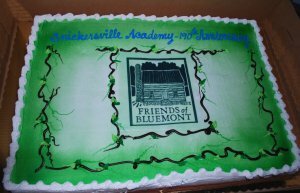 On May 16, Bluemonters celebrated the 190th anniversary of the village's first school and church, the venerable Snickersville Acacamy. Snickersville Academy, May 16, 2015. Honorees: Susan Freis Falknor (Friends of Bluemont), Rev. 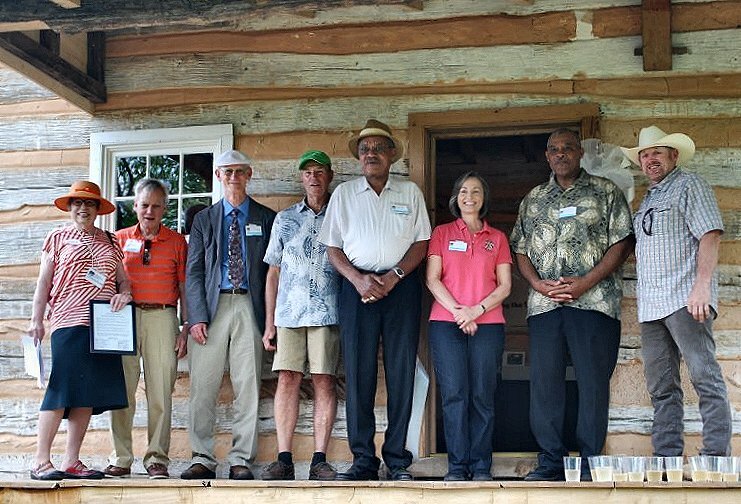 Wesley Corber (Bluemont United Methodist Church), Don Coram (descendant of Amos and Elizabeth Clayton), Mark Zalewski (Friends of Bluemont Vice President for Restoration), Ernest Gibson (descendant of Susie Neal) Janet Clarke (Loudoun County Blue Ridge Supervisors), Courtney Gibson (Susie Neal descendant), and Allen Cochran (historic building restorer). Note that the Gibson brothers were born in the cabin during Susie Neal's tenure there, the 1940s to the 1970s. Glasses of champagne poured for toast--lower right. Photos by Cynthia Morris. 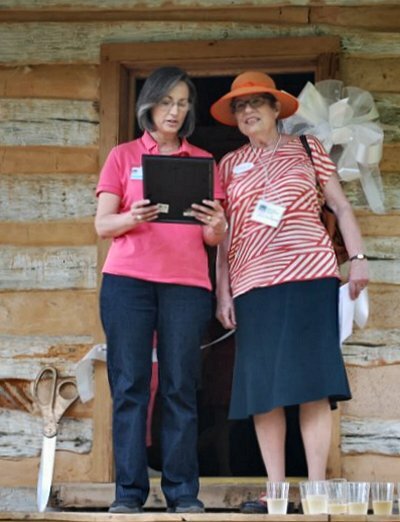 Many who helped with Friends of Bluemont's restoration of the Academy were there. In fact, virtually all of the approximately 60 people who attended had helped in some capacity: either in the form of Friends of Bluemont memberships, in-kind gifts, contributions, or encouragement. Taken as a whole, the celebration put many of today's Bluemont residents in personal touch with the Susie Neal family, the Clayton family, the skilled craftsmen restorers, immediate neighbors to the Academy grounds (both long-time residents and newcomers), and others who grew up in Bluemont--including those who still worship at the old stone Bluemont church (successor to the 1825 church in the schoolhouse) that their Osburn ancestors helped established in 1852. Janet Clarke, Supervisor for Loudoun County's Blue Ridge District, presented a message of congratulations from the county's Board of Supervisors (above). Bluemont's Henry Plaster, whose family goes back to the early 1800s, gave a talk on the importance of local history (left). Party-goers at the second annual Bluemont "Spring Fling" walked up from Stone's field in the center of Bluemont at 3:30 to join the celebration (top left). 190th anniversary celebration cake, below, right. On May 21, 1825, almost a century ago, Amos and Elizabeth Clayton signed a legal document--called an "indenture"--to give a half acre of land for use as a school and place of public worship, for the consideration of $1. 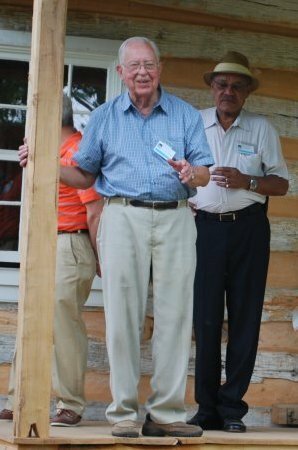 Friends of Bluemont has been at work raising funds and restoring the Snickersville Academy since receiving it in September 2010, as a gift of the Hatcher family. With the school porch by Cochran Timberframing and the gravel walking path from Snickersville Turnpike by Epling Landscaping coming into place this month, the restoration has made much progress. Friends of Bluemont looks forward to raising the final necessary funds to complete the roof and to then make the Academy grounds open to the public during daylight hours. It is hoped that, through the work of BCA's Lake Store Committee and Bluemont Heritage Committee, the E.E. 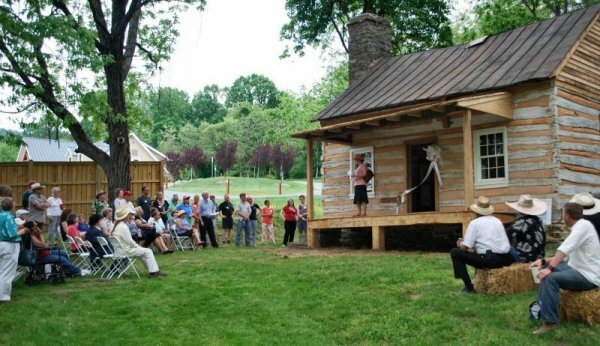 Lake Store will become a Loudoun County Welcome Center by 2017. Bluemont may then be able to show off more of its history for residents and visitor's alike.